Are you in the market for the Best MPC Drum machine but have no idea which one to select? If yes, we put together some information that can help you select the best drum machine in the market. Whether you’re looking for the best MPC for beginner, best MPC for sampling or you’re a fan of the Akai MPC pads, swing and feel, there’s definitely something for you. 2.1 Choosing Your Drum Machine? 2.3 Why The MPC Is The Best! Below you’ll find reviews and information to help pick the best one for you, plus a few alternatives to the timeless classic feel and flow of the MPC, with a bunch of new features to help you create beats in today’s new digital world of production. Music Are you looking to chop up drums with the use of pads and create natural drum patterns and flow? If creating your own unique sound by uploading your own different sounds onto a machine interests you then a pad based sampling drum machine might be for you. This way you can manipulate the sound to suit your personal taste, add you own flavor to classic drum breaks, and even sample sounds and textures for layers and movement. Size If you’re planning on moving it around, a smaller version might be the best option. However, larger units are better for performance but they take up a lot of space. If you’re a casual music player and not yet venturing into the big leagues a small version is ideal. This will depend on whether you’re traditional or contemporary in your music taste. If you’re tech savvy the digital MPC Drum Machine is the way to go. Beginner? Then the digital version is highly recommended. It’s easier to navigate because of the user friendly built in features. The MPC was originally built as a analog standalone drum machine in the 80’s, and was heality used by both hip hop and techno producers in the 90’s to deliver what some would say are the best tracks in dance and hip hop history. A Lot has changed in the studio since the golden days of the MPC 60, and now producers and beat makers are creating complete masterpieces from the bedroom studios and laptops. Check out our in depth review of the best midi pad controllers if you are ready to use leverage the style and flow of old school MPC pads, with the the limitless production power of midi based controllers that connect seamlessly to your DAW. Akai have not fallen behind in this mass movement of producers previously creating tracks on the all-in-one analog drum machines like the mpc 1000 and now producing on light weight, portable, pad based midi controller. Check out our complete review of the AKIA MPD range, these are newest range of pad based drum machines, inspired by the original MPC range, with all the old features and more. Why The MPC Is The Best! The beauty of this product is you can pursue your passion in creating music without necessarily owning a studio, simply an MPC, or an MPD plus a laptop is enough to product an entire album from top to bottom theses days. Prior knowledge of music education is not mandatory, chopping up samples and layering beats is an art that can not be taught in school. Never played a traditional musical instrument in your life? Worry not. You can still operate an MPC Drum Machine. Start creating beats within minutes of switching the machine on, uploading a sample pack and tapping out some new drum patterns. The MPC has claimed its place in the hall of fame in so many styles and hit records through producers using it’s unique pads and swing to sample records from the 60’, 70’s and 80’s to transform them into new tracks. The best way to get started on any of the MPC’s is to first create a drum beat with the pads, either from a records that you have in your collection, or a sample pack from your hard drive. Additionally, you can set up a MIDI Keyboard to be able to operate the MPC’s preloaded sounds and play them out in cords. To make life easier you can always get the version that comes with headphones and power supply cords. With the aid of a few online tutorials you’ll be a pro in no time. If, however, you’re interested in live performances, then the Digital version of the MPC is your best bet because it comes with scenes. They help you build or sketch an entire track. You can create scenes for your intro or main track depending on your preference. To achieve the ultimate best results from your machine, it’s determined by how much memory you need and the intended use of the machine. Memory refers to how many songs or tracks your machine can hold. If you’re planning on using it on stage you’ll need more memory for mixing and sampling your tracks. This is another reason so many producers are moving away from the original analog MPC and moving over to the MPC Studio and MPD range, as all the memory is stored on your laptop. Plus, the quick easy editing abilities that your laptop offers. 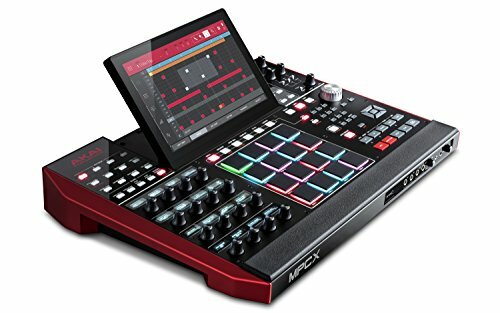 If you’re at the beginner level of your music career then the Akai MPC Drum Machine might be the best machine selection. It works well for either digital or analog studio setups. You don’t necessarily need a drum machine to make quality music, but this piece can literally transform your songs into masterpieces! It’s important you register your product soon after purchase. This will enable you to access the software which you’ll in turn download and install onto the machine. This is necessary to access programs needed to operate it. In the event that sound doesn’t come out after installation restart the computer and you’ll be on your way! With any high tech instruments there are controversies. You don’t need musical gymnastics to operate these products. With practice you’ll be a pro in no time. If you’re worried about breaking the bank, be assured that there is an instrument to suit every budget. 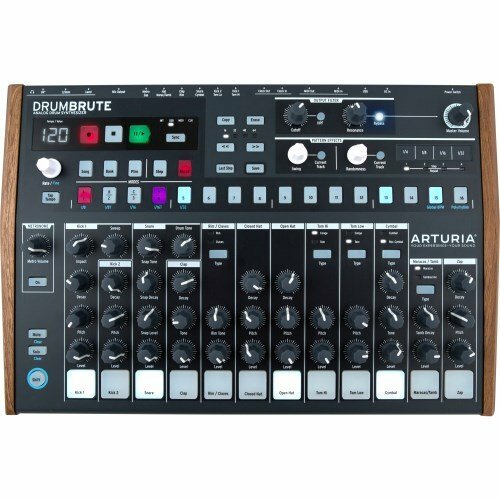 This instrument is a cutting-edge production unit which combines a variety of programs including 128 track sequencing capabilities, real time stretching, clip launch functionality and advanced MIDI editing capabilities. This particular version has larger knobs as well as a larger master encoder wheel than the other versions. It also has thicker MPC pads. The workflow on this machine is generally good because once you understand it you will be able to make music fast. It requires a driver install in order to successfully operate it with the computer. This is however freely accessible on the Akai website. It has a large LCD screen which allows you to make tracks without having to constantly look at your computer. This instrument merges real MPC pads and iconic workflow with the same MPC Software used by the MPC Renaissance to give you an integrated production solution. This MPC is characteristic of the post MPC Drum Machine age. It embodies the past, present and future of beat oriented production machines. As the name depicts it’s a standalone unit but still offers holistic maximum performance. You can either use it with a computer or not, it’s essentially up to you. This means it can be alternated from being a formidable standalone to a high powered MIDI controller. It comes with 16G of internal storage plus an impressive 10G of world class sounds. It has a multi touch screen which offers you complete control. You will be able to chop samples, grab and pinch wave forms, add effects and set controls all with your fingertips. It features two USB slots for MIDI controller connectivity and also has a built in SD card slot. This one belongs to the modern class of performance-ready instruments. It combines the traditional TR-808 and TR-909 with modern function and features. The T-R8 will enable you to play instruments and record to steps in real time. It has genre-defining sounds, classic effects and live pattern manipulation. It also has a pattern copy and pattern randomization to aid spontaneous creativity. This particular instrument possesses solid intuitive performance controls. It has a 7 segment, 4 character LED display and 16 per step pads with bold, full color LEDs. Unfortunately, it doesn’t come with all the necessary features required for maximum performance such as separate outputs for processing. This is largely an all-in-one analog hardware drum machine. One of its core functions is to create a combination of high performance and in-depth editing. It comes with a T-bar which will prevent your instrument from accidentally disconnecting. It has a full user manual which makes life a lot easier. One of its main features is to provide exceptional classic drum sounds. It has a wide range of controls designed to allow for trying many new and unique sounds. It also has a pattern looper that enables beat repeat functions. 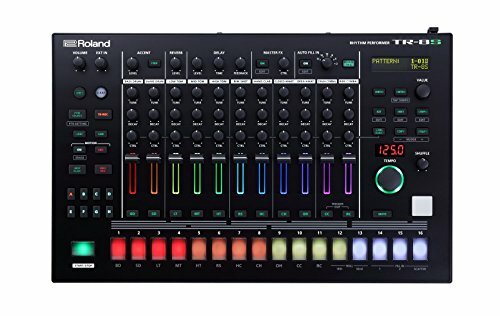 It comes with 17 true analog sounds, unique performance effects and a modern step sequencer. It boasts state of the art connectivity. All sound parameters on this machine can be changed instantly. The difference between this particular instrument and the initial rhythm composers is it has audio specifications and a lower noise floor. This range of instruments is particularly known for its software instruments that develop both software and hardware for audio creation, recording as well as production to mention a few. 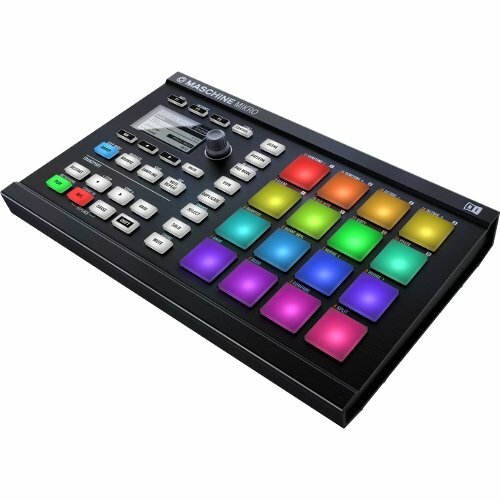 We will particularly review the Native Instruments Maschine Mikro MK2 Groove Production Studio, Black. It is the perfect initiation into the world of beat making. You have hands-on control for beat production, sampling and performance. You can use it for a variety of programs including live applications and finger drumming. This instrument also has a fast tag-based browser, enabling your creativity much more quickly. It has a new scale and chord engine fully integrated into the Maschine workflow. It also allows you full keyboard functionality within the Maschine environment. 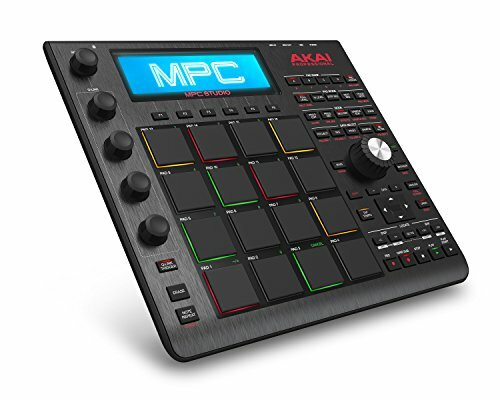 For us, the Akai Professional MPC X Standalone is the best Akai MPC in the market. You can operate it easily on the hardware unit via the touch screen This essentially makes it very user friendly and the best MPC for beginner. If you’re still trying to get the hang of the MPC studio instruments you’ll be able to navigate quickly thus making it beginner friendly. Even if you start at beginner level you can quickly advance to a professional level with this particular instrument. Due to its standalone nature it’s quite portable. The prompts are quite intuitive so in no time you’ll be a pro. What to learn more about the MPD range and other alternatives to the MPC? Check out these product reviews of the Best Midi Pad Controllers on the market. High quality, trusted brands such as Native Instruments and Novation have now entered the market, and are now at the top of the game when it come to pad based drum machines.